Be sure to check what everyone else has added to their shelves over at Tynga's Reviews! Fab fab fab! I love how you got so many cool cookbooks for Christmas. So many amazing books! Meant to Be is adorable. My Life Next Door is sweet. The Sea of Tranquility is intense. And Cinder! Oh my gosh. I am listening to it via audiobook and I am almost done. It is amazing! I really don't like anything even remotely science fiction, but Cinder is an exception! You're making me really excited to read these! I've heard such great things about most of them, and I love that you're just confirming it. Yay! So I just might be getting hungry just by looking at those cookbooks! 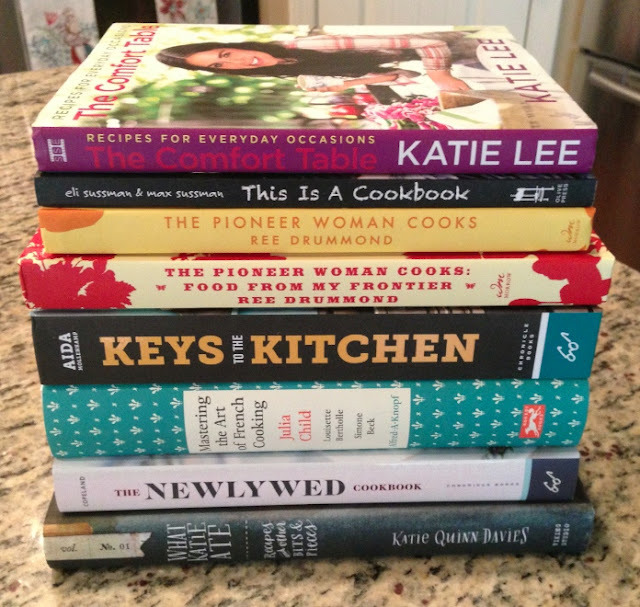 I do own The Pioneer Woman cooks, but would also love to have Katie Lee's cookbook. Looks like you definitely have some good meals in front of you. I am just now learning about Pioneer Woman. Where have I been?! I haven't read any Juliet Marillier. I know - please do not revoke my YA Fantasy Fantatic card! YAY for Throne of Glass! I think you'll LOVE it. Also since I'm fresh off of reading Cinder, HOORAY CINDER. I don't really follow her blog consistently, but I love dropping in every now and then. Her cookbooks have really home-y food that not's too fancy or out there. Which is what I like haha! I can't believe you haven't read any Juliet Marillier! I thought for sure you would have since you're a fantasy lover. Better get to it! Excited for Cinder and Throne of Glass! Woo! Yay for Stacking the Shelves first timers! I've just stated Under the Never Sky - it's good so far! I'm just having to get into the story and learn the new world. Oh my goodness LOOK AT ALL THOSE COOK BOOKS. I am so hungry for food now. Cinder -- GET READY FOR AWESOME. My Life Next Door - Get read for all of the swoons. Daughter Of The Forest - One of the Best books ever! Meant To Be - Totally sigh inducing. The Sea Of Tranquility - aka ALL OF THE EMOTIONS EVER. And I've heard amazing things about Daughter of the Forest, so I'm looking forward to it. I really do have some good reading ahead of me, don't I? Yay 2013! So much! So much! But DAUGHTER OF THE FOREST DAUGHTER OF THE FOREST!!!!!!! AAAHHH! Oh my gracious, my heart just leapt. LEAPT. I am seriously a lover of fantasy, and I can see that you are moving from Graceling and Fire into the world of Juliet Marillier. You must've loved the fantasy world. I am so happy. So very happy. I just re-read Cinder and Under the Never Sky - both even better the second time. You will love them the first time if you haven't read them yet. So much fun. Seriously. My Life Next Door - one of my favorite contemps EVER. So well written, I can't believe it is a debut. Also Meant To Be is so quirky and funny, laugh-out-loud funny, I thought. I have Safe Haven and The Sea of Tranquility but I haven't read either of them yet. I need to. I KNEW you'd love that I got Daughter of the Forest! I figured I need to move forward with my fantasy experiences and read one I've heard everyone loves. I'm looking forward to it! It will be a first read of Cinder and Under the Never Sky for me - glad to hear that you love them both! I'm really excited about My Life Next Door! It just looks so adorable. I just finished Meant to Be recently, and I enjoyed it but wanted a little more from it. There were a few things that just didn't really work for me! But yes, it was funny! Holy cookbooks! I love cookbooks. :) And the Pioneer Woman! LOVE HER! I get lots of recipes off of her website! Thanks Kristilyn! I definitely used some Christmas money to get books that had been on my reading list for a while. Now I just have to read them all so they don't spend forever on my TBR!